One of the reasons why I like playing videogames are the God-like abilities I am bestowed with. There's a certain feeling of omnipotence when I control a pudgy plumber as he saves a WASPy princess, or resurrecting my World War II soldier unscathed as he continues fighting Nazi forces. In Press Play’s Max and the Magic Marker, however, the only thing my hand wields is a giant orange marker, whose drawings can magically come to life. I also get to control the movements of protagonist Max, but Max isn’t capable of much. So when he struggles to climb over a wall that’s too tall, I must divinely intervene and draw a small step to help poor Max. Instead of feeling omnipotent, I end up feeling a bit paternal. Then again, blame Max, who got me into this mess in the first place. Out of the blue, he received this magic marker in the mail. He soon realized that whatever he drew with this market came into fruition, but instead of drawing bags of money, the cure to rabies, or absolutely anything else that is useful, he drew monsters, which we now must stop. 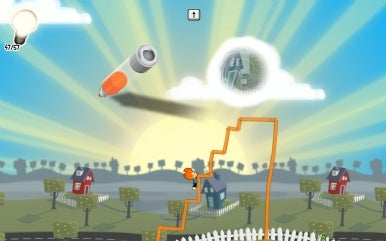 The drawing game mechanic isn't particularly original (Crayon Physics Deluxe, Kirby Canvas Curse, and Scribblenauts are some leading games loosely based on the same concept of drawing physical objects or paths to move towards a goal), but the pairing with the platform genre and the game's unique art style make it stand out. 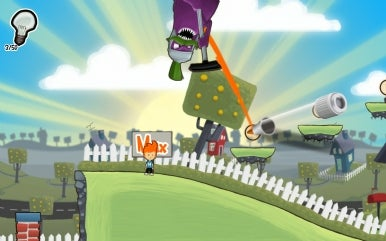 While manipulating Max may not be the most exciting thing, there is real genuine fun to be had for kids eight years and older when it comes to messing around with the physics and the world that surrounds him. Drawing stairs is just one of the many ways you'll need to help Max. The great thing about this game is that you actually have to think. 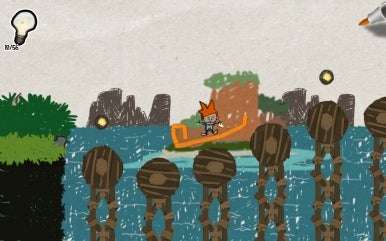 It plays like a standard platform game, but you must draw your way across the world to get Max into the whirlpool exit and through the next level. It’s not as simple as drawing a line between two cliffs or going from point A to point B. You draw weights and seesaws to bounce Max up to a higher plane, shields that protect him from falling volcano debris, and miniature rafts so he can traverse through rotating cylinders. Puzzles and situations like this kept me so captivated that the game did in fact feel refreshing. Max and the Magic Marker also has a very unique pause option, which renders everything into a children’s drawing. While paused, the children’s drawing suspends Max and the rest of the world in time. You can still control that big orange marker in the sky though, and this comes in handy when you need to draw something for Max mid-air. Sometimes the game renders this ability essential (like when I need Max to jump up top a billowing column of steam before I can draw a board he can float on), but most of the time I needed the time-suspension option because I was just a bad animator who is now desperately pausing the game to save Max from my shoddy workmanship. That’s the other great thing about this game—you never know how something will physically function until Max gets a hold of it. Sometimes you think you just drew the best bridge in the world, only to find out that you made it too top heavy when Max’s weight collapses the whole structure. It’s frustrating sometimes, but it also provides a fun challenge. The pause option alone is a great reason to play this game. Another reason you can’t be a slacker on this game is the fact that you aren’t given an infinite amount of ink. After certain checkpoints, a huge purple monster named Mustacho, who looks like the McDonald’s Grimace crossed with Kaiser Wilhelm I, comes and robs you of your hard earned ink. You’ll have to collect ink bubbles again to compensate, but this way, the game makes sure that you are only given just enough ink to build whatever contraption you must, using the fewest strokes possible. One thing I loved about the game was the richness of the animation. The art style is based on children’s’ drawings, which the creators actually referred to when designing the backdrop and overall look of Max and the Magic Marker. The drawings are cutesy, even nostalgic at times, and the colors are lush. Surprisingly, the main villains of this game are quite unremarkable. They’re just these short nuggety purple blobs that bounce around on the floor. It was almost as if the design team used all their creativity and had none left when it came to creating the direct antagonist of the game. Oh well. There are some other technical oversights I wish were addressed. One thing I found extremely annoying was the narrow zoom of the camera, effectively reducing your line of vision so you can’t tell what’s ahead of you, what you need to do, and most importantly: what you need to draw. The game will just leave Max at the edge of a cliff or an edge of island and you have to purposely take a huge leap towards your death just to see what’s beyond the screen. I played on my 2.66GHz Core 2 Duo MacBook Pro and found that switching between navigating Max with the keyboard and drawing with the mouse became tiring very quickly. Although I realize there’s no real other way around it, it still bugged me, and I can see why this game excels better on a Wii system. Furthermore, despite the fact that there are plenty of diverse puzzles for Max to solve in order to get around physical barriers and such, I would say a bulk of the gameplay is spent drawing stairs, lots of them. One can only draw staircases a couple dozen times within the hour before going crazy. You'll occasionally have your ink drained by a giant eggplant. Max and the Magic Marker doesn't have an earth-shattering game concept, but that's OK, because the game is so well executed. The colorful graphics, the puzzles, and the undeniable cuteness of it all made the game quite charming. Of course, the switching back and forth between the mouse and those staircases gets a bit repetitive and frustrating, but for a kid, I could see how their relentlessness would probably keep the ball rolling. The game retails for $20 with four hours of gameplay time, but it can go on for much longer, considering how smart you are at figuring out this stuff and the fact that there are a few hidden treasures to seek out (like the oh-so-elusive ball of black ink). Max and the Magic Marker is an enjoyable and clever platformer that will most likely keep kids engaged for hours—allowing them to color inside, outside and all around the lines.